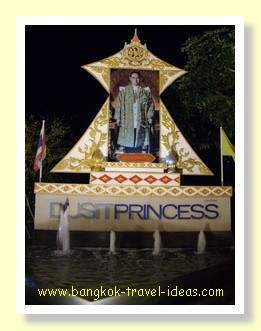 Want to go to Korat? I have been before and wanted to have another look at this interesting town. So on the Monday, which was the Western Boxing Day, we set out for the city of Korat, otherwise known as Nakhon Ratchasima, located about 4 hours drive and to the North East of Bangkok. Whenever you are leaving Bangkok it is always advisable to get an early start and that way you have left the city well behind, before people set off to go work. On this day we left at 5:00am and took the expressway up towards Bang Pa-in onto Saraburi and then Pak Chong. We followed the instructions given to us by our old friend Google Maps, printed out onto an A4 piece of paper. After driving for a couple of hours we stopped to get fuel and have breakfast at one of the roadside petrol stations. The one good thing about the major highways in Thailand is that petrol stations come with toilet blocks and somewhere to eat and have a rest. You don’t need to search for a key or have to buy a meal, the services are already there and free. 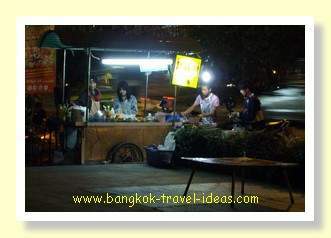 This particular restaurant was a collection of food stalls that used the ticket system that is quite common in Thailand. 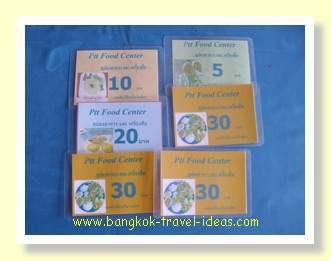 There was a little desk in the centre to purchase the food ticket and once you had selected your food you just exchanged the ticket with the vendor. I don’t recall what I ate but there was a big selection of Thai food on offer and no Western food at all, which suited me fine. We left the petrol station behind and continued on our way. Around this area the road started to get a bit hilly and windy and you have to careful of the big trucks as they go up the big hills. Maintaining speed and staying in the outside lane seemed to be safest strategy. Even though it was still relatively early there was a lot of traffic, but fortunately it was moving freely. 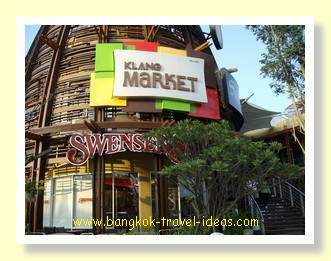 In this area you can take a right turn to the National Park of Khao Yai. We didn't stop on the way out, but intended to have a look around on the return journey. As we continued on past a large dam on the left side, I could look out over the water and hills beyond. This is a popular place for tourists to stop and they have viewing points to park your car and look over the dam. There are also a range of shops where you can pick up souvenirs of your trip. This dam supplies water to Bangkok and at the beginning of the dry season it was still relatively full. As we got just outside Nakhon Ratchasima there is a large white Buddhist temple, on the left hand side, that is worth stopping at. Coming into Nakhon Ratchasima we must have taken the wrong turning and we got disorientated a little bit. After driving for 15 minutes or so and not seeing our hotel we stopped at a police booth to ask directions and we were soon on our way again. I think what happened is that we continued on Route 2 instead of going straight ahead on the road that became Route 224 and then taking a left onto Route 225. We ended up having to go back down Route 225 and approach the hotel from the other direction. We had a booking at the Dusit Hotel at Korat, courtesy of Thai Airways frequent flier points. I really had no idea of where it was in relation to the centre of the town but we followed the instructions given to us by the policeman and the hotel was easily located and it is just on the outskirts of town. We parked the car and checked in and moved the baggage to our room and then got a map from the reception desk, so we could find our way around. After looking at the map we decided to walk into along Suranai Road into town. It was a little further than we thought and we discovered later that the map was a simple tourist map and not to scale and in fact there were many errors in the map itself. Anyway we set out walking into town as a good way to get to know an area is to walk around and part of the fun of visiting a new place is to learn what goes on there and there is no better way to do that than to walk around. There are two big universities on Suranai Road and there were heaps of eating places and little shops in that area. Of course it was also packed with students. 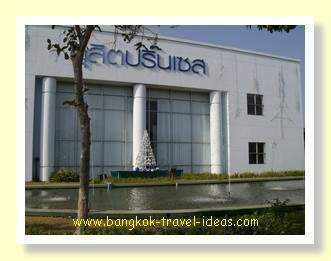 The first one is called Rajamonkol University of IE Technology and the second is Nakhon Ratchasima Rajabhat University. 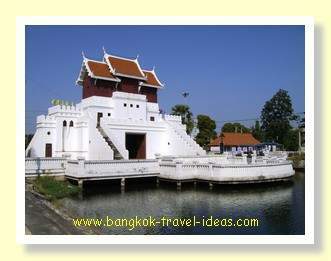 Nakhon Ratchasima is a fortress town that is still surrounded by moats on four sides. It was built in the late 17th century under instruction from King Narai of Ayutthaya to protect the city from possible attack by the Khmer. The central area of the town behind the moat is a rectangle 1km x 1.5km. It took about 25 minutes of steady walking to reach the outskirts of the town and cross the bridge over the moat. From there we just wandered around the streets looking around for about 30 minutes without seeing anything very interesting. It wasn't that hot but there was a lot of traffic and the school children were all coming out of school and it was fairly busy. Not finding anything of particular interest we set off walking back to the hotel and began to think about what to do in the evening. On the way back to the hotel there were lots of small shops, but we called into a small shopping centre where we picked up some milk and snacks. Loaded up with provisions we continued back to the hotel, just a few hundred metres further on. Arriving back at the Dusit Princess hotel we went and sat around the swimming pool and listened to music and I cleared out some emails. Luckily the hotel WiFi reached into the pool area which was very convenient. The temperature was just pleasant and not hot at all but after being in the swimming pool at Hua Hin I reckoned that it would be even colder here, so swimming was given a miss. At night we wandered out onto Suranai Road and back up towards the Klang shopping centre, thinking that we might eat there. On the way we came across someone setting up tables on the forecourt in front of some of the shops. The shops were closed and it was decided to eat there. Basically they put raffia mats on the floor with a low table. 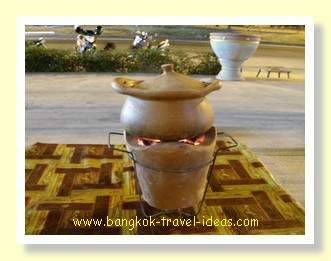 The cooking was done in an earthenware pot with a charcoal heat source to boil the water. From the menu you could select vegetables and raw meats and seafood which you then cook in the pot of water. The meal comes with a spicy sauce and some rice and is very delicious and for two people it cost 300 Baht. This style of eating is a similar thing to the chain MK Restaurant or Sukiyaki and is known as "hot pot", not to be confused with the English dish of the same name. We were sitting quite a way back from the main road and the traffic had reduced considerably by now. 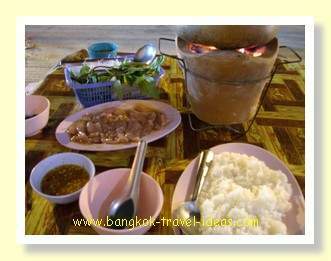 The concrete floor and buildings were still radiating the heat from the day and so it was really quite pleasant sitting out like that and if you go to Korat you should really give this style of eating a try. Whilst we were eating there was a small elephant being led along the pavement and the diners next to the roadside were given the chance to buy a small bunch of bananas and feed the elephant. Unfortunately it was a little too dark to get a good photograph. Back at the hotel we asked for assistance from the hotel reception as we wanted to visit the statue of Khun Mae. The receptionist was really helpful and pointed out where we needed to go on the map. Once she pointed out where we needed to go we could see it easily. If you enjoyed reading my Thailand travel diary so far then explore more excitement in Korat on Day 2 or just jump to a different day using the links below. When I go to Korat and explore the town of Nakhon Ratchasima on foot, see what happens when I visit the famous shrine to Thao Suranaree (Ya Mo), who is credited with saving the township from the marauding Khmer troops. Walk around Korat on foot and visit the market and Buddhist temple at the entrance to the old town. Explore the majestic waterfalls of the Khao Yai National Park, see Thai elephants and monkeys in their natural habitat.